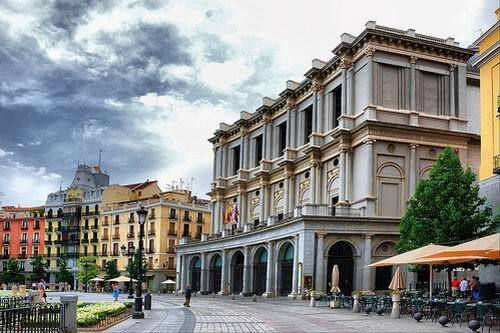 The Teatro Real, or Royal Theatre, in Madrid is located in front of the Royal Palace, between the two plazas, or squares, of Plaza de Isabel II and Plaza de Oriente, and right next to the famous Café de Oriente. It stands where the old theatre of Los Caños del Peral once stood. Los Caños del Peral was built in 1708 and was pulled down when almost a ruin in 1818 to make way for the new Teatro Real. Construction of the new theatre was erratic for around 30 years due to the lack of funding. Tha half-completed building was used for various purposes in between: a dance hall, the Guardia Civil quarters, a powder store and more. Queen Isabel II who was an opera lover took an interest in the construction, and in 1848 work restarted in earnest. It was officially inaugurated on the Queen's birthday, November 19th, 1850, with a performance of La Favorita by Gaetano Donizetti. The young Queen called the splendid new structure, Teatro de la Opera. In 1925 it was realised that the building's foundations were suffering from damage caused by underground water flow. Due to funding problems it wasn't until 1965 that the Teatro Real finally reopened. 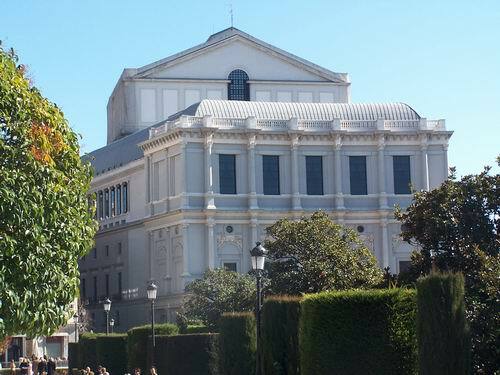 However, it was no longer dedicated to opera; it was merely a concert hall as well as being the headquarters of the Orquesta Sinfónica de Madrid. Temporarily abandoning its opera roots, the Teatro Real hosted the 14th Eurovision Song Contest in 1969. The performers had to compete for dominance on stage with a striking metal sculpture created by Spain's leading surrealist artist, Salvador Dalí. In 1988 the Teatro Real was closed once again for extensive refurbishment. Nine years later in 1997 it once again opened its doors to the public, this time as a world class opera house. There was much acclaim for the styling, which reflects a 19th century look and feel. It is considered by many to be one of the finest stages in the world for opera with excellent acoustics. The Teatro Real is now home to the Compañía del Teatro Real. They specialise in opera, though also ballet on occasion. They regularly work with most of Spain's leading talent in opera, including world famous names such as Plácido Domingo. The theatre has also become an important venue for major performances of classical music. There are daily tours of the Teatro Real. There is also a fascinating museum to explore. To reach Teatro Real take the Metro de Madrid to the nearest Metro station, which is appropriately called Opera on line 2. It lies immediately to the south of the building.